Thomas Donilon, U.S. National Security Advisor on “The U.S. and Asia in 2013: Challenges and Opportunities” – March 11, 2013.
by Irith Jawetz at the Asia Society House on Park Avenue, New York City, Monday March 11, 2013. Introductory remarks were by Ms. Henrietta Fore, Co-Chair of Asia Society and Chairman and CEO of Holsman International, a manufacturing, consulting and investment company. She stressed the importance of the Series of talks at the Asia Society – “Beyond the Headlines” – and said that the Asia Society shares views of cooperation, alliances, and links between the United States and Asia. There are many challenges in the relationship between the US and Asia, she said – especially when it comes to North Korea – but the opportunities for cooperation outweigh the challenges, she sad. Her approach to foreign policy was a business woman line – the issue being that challenges and opportunities were understood in business terms. Ms. Fore continued by introducing the speaker – Mr. Thomas Donilon. Thomas Donilon is the new National Security Advisor to President Barack Obama. From 2009 to 2010, he served as Assistant to the President and Deputy National Security Advisor. He chaired the State Department’s transition effort in 2008. Prior to this, he was a partner at O’Melveny & Myers LLP and served as a member of the firm’s global governing committee. He has worked closely with and advised three U.S. Presidents since his first position at the White House working with President Carter. He served in the Clinton Administration as Assistant Secretary of State and Chief of Staff of the Department. In this capacity he was responsible for the development and implementation of the Department’s major policy initiatives, including NATO expansion, the Dayton Peace Accords, and the Middle East Peace process. He was awarded the Secretary of State’s Distinguished Service Award in November 1996. His interest in policy does not mean business first. What was he doing at Asia Society during this lunch-time break? Mr. Donilon started his presentation by acknowledging his good friend Richard Holbrook who was a real “Asia hand” and credited him for dedicating all his efforts to peace and cooperation everywhere. Now – that was the answer to the question in my head. Mr. Danilon came to honor the departed Mr. Holbrook and not because of those present there. Donilon gave a general review of the Obama Administration’s goals in Asia for his second term. The United States has been over weighted in some area, i.,e. the Middle East and under weighted in other area, i.e. Asia – and the Obama Administration will make sure to strengthen the ties between the US and the Asia Pacific region. He mentioned the friendship and cooperation with Japan’s new leadership, with China’s leadership, the friendship with India, and a solid commitment to the security of the Republic of Korea, and announced that the new woman President of the Republic of Korea, Ms. Park will visit the White House this coming May. The challenges are mainly with North Korea. For 60 years the United States has protected the Republic of Korea and will not accept any nuclear programs in North Korea. There will be consequences if North Korea continues to pursue its nuclear goals. However, there will always be a window open for talks if North Korea changes its course. He brought as example the country of Myanmar with whom the US has now a good relationship. North Korea could take an example from Myanmar. Mr. Donilon touched upon the good relationship between the US and India, Indonesia, a country that is personally close to Mr. Obama, and China. In relations to China he mentioned that a military dialogue is necessary, economic relations are opening up, however there are problems regarding the cyber security. The Internet has to be open, secure and reliable and there are still concerns in that field. He further mentioned the TPP, Trans Pacific Partnership, – an organization which now has 11 members, but could be a podium for many countries to join and cooperate for free and open trade between the countries. In conclusion, he again stressed that the ties between the United States and Asia are a very important subject in the Obama Administration. Ms. Suzanne DiMaggio, Vice President of Global Policy Programs at Asia Society read a few questions, one relating to Afghanistan and Pakistan. with the US forces in an advisory capacity as of May 2013, and the full withdrawal of US troops from that country by September 31, 2014. The main goal is to defeat Al Qaeda and to ensure that Afghanistan does not become a future haven for terrorists. As for Pakistan there have always been problems between the US and Pakistan especially after a crisis, i.e. the capture of Osama Bin Laden, but the US is committed to work through those problems and to ensure a stable Pakistan. Mr. Tom Nagorski closed the session with a concluding remarks thanking Mr. Donilon for his excellent speech and also thanking him for his kind remarks regarding Richard Holbrook. Tom Nagorski is Executive Vice President of the Asia Society since October 2012 following a three-decade career in journalism – having served most recently as Managing Editor for International Coverage of ABC News. Before that he was Foreign Editor for World News Tonight and a reporter and producer based in Russia, Germany and Thailand. He is the recipient of eight Emmy awards and the Dupont Award for excellence in International coverage as well as a fellowship from the Henry Luce Foundation. He looked like he understood why Mr. Donilon spent his time here and the fact that the business community ought to understand better the motives of an umbrella approach to foreign policy that comes with a reset away from the oil region. U.S. Restores Full Ties to Myanmar After Rapid Reforms – Could Iran Learn that There is more Long-Term Profit in Negotiating an Exit Strategy with the United States? U.S. Restores Full Ties to Myanmar After Rapid Reforms. The action is a diplomatic reward for recent political reforms by Myanmar’s civilian government, including the release of top activists on Friday. SECRETARY OF STATE HILLARY RODHAM CLINTON, on the move to normalize diplomatic relations between the United States and Myanmar following sweeping political reforms. Freeing the prisoners, which President Obama praised as a “substantial step forward for democratic reform,” was one of the most significant gestures yet by Myanmar’s new civilian government to address international concerns about the country’s repressive history, which led to decades of diplomatic and economic isolation. 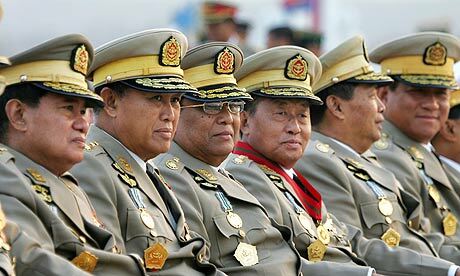 The releases — described in official reports as an amnesty — occurred around the country and included political activists, journalists, leaders of ethnic minority groups and relatives of the dictator who led the coup in 1962, Gen. Ne Win. Among 651 prisoners given amnesty on Friday were leaders of the brutally repressed student protests in 1988; a former prime minister, Khin Nyunt, ousted in an internal purge in 2004; and monks and others involved in antigovernment protests in 2007 that were known as the “saffron revolution.” A senior State Department official in Washington described Myanmar’s move on Friday as the largest single release of political prisoners in Asia’s history. by some accounts Mr. Thein Sein’s government has now released as many as half of 1,000 to 2,000 in custody. The administration’s reciprocal announcement is the latest in a series of cautious moves that have significantly eased tensions between the United States and Myanmar, also known as Burma. The diplomatic engagement — which one senior administration official said would have seemed unthinkable a year ago — now appears to be accelerating, though he and other officials stopped short of calling it irreversible. A renewed relationship between the two countries has the potential to remake American diplomacy in Asia, where the Obama administration says it hopes to refocus its foreign policy at a time when China’s influence is expanding. The closer ties could enhance trade and help integrate Myanmar into regional alliances sympathetic to the West. Since taking office last March, the country’s president, U Thein Sein, has overseen a raft of changes that appear to indicate a new willingness to end military rule for the first time since a coup in 1962. He has sought to reform the economy, allow political competition and end the country’s economic and diplomatic dependence on China, its huge neighbor to the north. In a move that presages a far broader shift in policies, his government halted work in September on a $3.6 billion dam under construction on the Irrawaddy River by a Chinese state company. 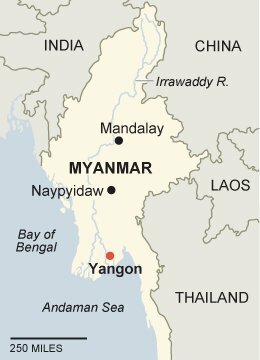 The United States never fully severed relations with Myanmar, as it did over the years with Iran, Cuba and North Korea, but it downgraded relations and withdrew its ambassador after elections in 1990. Those elections were won by the party of the main opposition leader, Daw Aung San Suu Kyi, though never recognized by the military government, which instead cracked down and put her under house arrest. Subsequent administrations have since toughened sanctions on most trade with Myanmar. The Obama administration is not yet considering lifting sanctions, but Mrs. Clinton announced that it would soon nominate an ambassador and invite Myanmar to send one to Washington. She pledged other actions in response to continued reforms, though she did not spell them out. Mrs. Clinton, who met with Mr. Thein Sein in the country’s newly built capital,Naypyidaw, pressed him to follow through with the nascent reforms, which he appears to be doing. Since her visit, the government scheduled special elections on April 1 to fill 48 vacant parliamentary seats. For the first time since 1990, Ms. Aung San Suu Kyi and her party will be allowed to seek elected office. The thaw with Myanmar is in some ways a belated success of the Obama administration’s early policy to engage with the United States’ enemies. The effort has failed with Syria, Iran and North Korea, and for at least for the first two years, Myanmar was no different. That has left many administration officials — and members of Congress — wary of moving too quickly. Myanmar, isolated for so long, is suddenly a diplomatic destination of choice. The British foreign secretary, William Hague, visited last week. France announced that its foreign minister, Alain Juppé, would travel there this weekend. The Senate’s Republican leader, Mitch McConnell of Kentucky, departed for Myanmar on Friday, soon to be followed by Senator John McCain, Republican of Arizona. Mr. McConnell, who annually sponsors legislation sanctioning Myanmar, said in a statement that Mr. Thein Sein’s government needed to do more to ensure free elections and disclose its military ties with North Korea. Updated: An Editorial Note – The US builds a new global position with a Trans-Pacific arch spanning from NAFTA to Indonesia and Australia without including China. This market starts from being 1.6 times the EU Free Trade zone. The papers wrote today, November 18th, on the small Asian Scene but missed the much bigger significance. After years of playing big power economic politics on the side of China and a mumbling and stumbling EU – the US did a reset, as per the following and most recent, news. “BALI, Indonesia — Hours before Daw Aung San Suu Kyi Myanmar’s most prominent democracy campaigner, announced her return to formal politics on Friday, President Obama disclosed that he was sending Secretary of State Hillary Rodham Clinton on a visit there next month, the first by a secretary of state in more than 50 years. Actually what happened these last three weeks is that Obama’s Administration is distancing itself from the troubles of the EU and in an effort to decrease its dependence on China financing, the US has moved to use the Asian-Pacific region minus China, but in in alliance with Australia, to forge a new FREE MARKET from an enlarged NAFTA (Canada, Mexico, Columbia) to embrace some of the countries of the old APEC. This market is 1.6 times larger then the EU and will have a military base in Darwin, Australia, so China takes notice of a massive new US interest in Asia. This is just a small reaction to the news and we intend to return to this new and intriguing situation that is clearly intended as well to show the American people that this Administration is still capable of doing great novel things. We say BRAVO. Europe will take advantage of this RESET by trying to increase its activities in the Arab World – i.e. Austria readies a new mission to Qatar where it will open December 11-12, 2011 a new Embassy in Doha with a visit by Austria’s Federal President Dr. Heinz Fischer who travels at the head of a business delegation as it was done these weeks as well by Austrian interests going to Iraq, Libya and Turkmenistan. Please note that the new Embassy in Doha is being opened while Austria is busy saving money by closing up to 30 Consulates and Embassies elsewhere i.e. in Chicago! We posted the above on November 18th, then on November 19th we found on the CNN/GPS the following, and we realize that our AMERICA IN A NEW ASIA RESET editorial note was our correct reading of the news. Again – we expect to enlarge on this very soon. Editor’s Note: Every week, the Global Public Square brings you some must-read editorials from around the world addressed to America and Americans. The series is called Listen up, America! Indonesia – NIMBY, or “not in my backyard,” says an editorial in the Jakarta Postof stationing U.S. troops in northern Australia. Early in his term, President Obama was too deferential to China. On his Asia trip last week, he sent a clear message that this country is not ceding anything in the Pacific. That is good news. New York Times EDITORIAL Published November 19th, printed in the November 20, 2011, paper. Like President George W. Bush, Mr. Obama’s preference is to engage Beijing in international organizations and agreements in hopes that will encourage China’s leaders to behave more responsibly. It is a sound long-range strategy. But China has made clear that without serious and sustained push-back, it will use its economic and military clout to bully and intimidate its neighbors. The most brazen example is its broad claim to energy reserves in the South China Sea that are also claimed by five other countries. On Friday, Wen Jiabao, the Chinese premier, said at an Asian summit meeting that “outside forces” had no right to get involved in the dispute. On his trip, Mr. Obama insisted he would “seek more opportunities for cooperation with Beijing.” But he also made clear that his patience has limits, at one point saying that China has now “grown up” and should act responsibly in its trade and currency practices. In Australia, he announced an agreement to deploy 2,500 Marines plus naval ships and aircraft to a base in Darwin starting next year. That is not a huge number, but it is a pointed symbol of America’s interest. At the same time, we were concerned by Mr. Obama’s declaration to Australia’s Parliament that budget reductions “will not — I repeat, will not — come at the expense of the Asia-Pacific.” Allies, of course, need to hear that. But any new mission in Asia cannot become another excuse for Pentagon planners to avoid making needed cuts. On his trip, the president also rightly championed the benefits of freer trade — a position made more credible after Congress finally passed the trade deal with South Korea. His push to negotiate a trade deal with eight other Pacific Rim countries is important. He must keep reminding Beijing that it is welcome to join if it makes the necessary economic reforms. What the United States should not do is overreach. Beijing already suspects that the real American goal is to “contain” its power. Washington must be transparent about its dealings and consult and include China when possible. American and Chinese political leaders have a regular dialogue. The Pentagon needs to do more to cultivate relationships with its resistant counterparts. Dealing with a rising China requires a deft hand and a willingness to push back when Beijing oversteps. Being there is a big part of it. India Western borders – Pakistan, Afghanistan are big trouble, but why does India not cover itself by magnanimously handling its Eastern border – Bangladesh, Bhutan, Nepal, Myanmar? A Teesta river water agreement could jump-start new life in the neighborhood with a full Delhi-Dhaka rapprochement. Ditching water-sharing deal, India fumbles historic opportunity to reshape neighborhood. Special to The Japan Times, Monday, Sep. 26, 2011. Harsh V. Pant teaches at King’s College, London. Manmohan Singh was visiting Dhaka to take forward the process of restoring credibility to Delhi-Dhaka ties initiated by his Bangladeshi counterpart during her visit to New Delhi in July 2010. Singh’s visit came 12 years after former Prime Minister Atal Bihari Vajpayee visited Dhaka in 1999. High-profile visits including those by Sonia Gandhi (all-powerful leader of the ruling Congress Party), the Indian external affairs minister and the Indian home minister had preceded the prime minister’s visit, laying the groundwork for a possible historic shift in Delhi-Dhaka ties. When Bangladeshi Prime Minister Sheikh Hasina visited New Delhi in 2010, she decided to go for a big gamble by putting all outstanding issues on the table and making it clear that Dhaka was a serious partner of New Delhi in counterterror operations and an economic bridge between India and its northeastern region. New Delhi tried to seize this opportunity and decided to give Hasina’s offers substantive weight by deciding to open Indian markets for Bangladeshi textiles and offering to resolve the dispute over how to share use of the Teesta and Feni rivers. Boundary issues have also been moving toward some sort of a resolution as the two sides move ahead in resolving the issues of small enclaves in each other’s territory. Insurgents operating in Indian’s northeast have tended to find a safe haven in Bangladesh for some decades now, but the Hasina government has taken a hard line against them, satisfying one of India’s major long-standing demands. India, for its part, has given strong instructions to its Border Security Force against shooting unarmed Bangladeshi civilians along the border areas even if they are found crossing the borders illegally. By restoring transborder connectivity via the northeast, India and Bangladesh will be laying the groundwork for larger regional economic integration involving Nepal, Bhutan and Myanmar. Even as the Indian prime minister was about to make his maiden voyage to Bangladesh, it was being suggested that India’s eastern neighborhood stood on the threshold of a remarkable transformation. However, Manmohan Singh’s visit fell much short of expectations. The two states did sign the landmark agreement on the demarcation of land boundaries and the exchange of adversely held enclaves, thereby settling the decades-old vexed border issue. Singh also announced 24-hour access for Bangladeshi nationals through the Tin Bigha corridor in addition to duty-free access for 46 textile items, effective immediately. India also declared that it help Bangladesh develop its ports and infrastructure as well as customs points and would supply bulk power to Bangladesh by connecting the two national grids. But Bangladesh was not satisfied, as a last-minute scrapping of the Teesta water-sharing deal — because of objections from West Bengal Chief Minister Mamata Banerjee to the draft of the agreement — left a bad taste. If these objections are not resolved soon, they might provide ammunition to anti-India elements in Bangladesh. Clarification was sought from the Indian envoy by the Bangladesh Foreign Ministry as to why India decided not to sign the treaty at the very last minute. The India-Bangladesh summit meeting came very close to collapsing. Sheikh Hasina’s visit had imparted a new direction to the course of Delhi-Dhaka ties. And Bangladesh has been rightly upset at the slow pace of implementing deals signed during Hasina’s visit. Hasina has taken great political risk to put momentum back into bilateral ties. But for a long time, there has been no serious attempt on India’s part to settle outstanding issues. Bureaucratic inertia and lack of political will has prevented many of the deals from following through. As India failed to reciprocate fully to Hasina’s overtures, the main opposition in Dhaka, the Bangladesh Nationalist Party (BNP), started using India-Bangladesh bonhomie under Hasina to attack the government for toeing India’s line. India-Bangladesh ties reached their lowest ebb during the 2001-2006 tenure of the BNP government. The BNP and its fundamentalist allies remain opposed to normalization of Delhi-Dhaka ties and have demanded that all bilateral deals be made public first. The country remains deeply divided. In India, too, various constituencies have stymied Delhi-Dhaka rapprochement. The Indian prime minister was to be accompanied by the chief ministers of five states bordering Bangladesh. But Mamta Banerjee, chief minister of West Bengal, decided not to go at the very last minute, expressing her disapproval of the final draft of the Teesta river water agreement. Moreover, domestic textile producers in India have been lobbying hard to resist opening up of Indian markets more fully to Bangladeshi goods. There is no doubt that India, as the larger economic power, should be magnanimous toward its neighbors. India remains fixated on its western border, but there is very little that India can do to change the regional dynamic there. It is India’s eastern neighbor that India should focus on and go the extra mile for. If India fails to swiftly capitalize on the propitious political circumstances in Bangladesh today, it will be damaging its credibility in the region even further. New Delhi’s window of opportunity with Dhaka will not last forever. Anti-Indian sentiments can be marginalized if India allows Bangladesh to harness its economic growth and presents it with greater opportunities. Yet, India remains overly obsessed with Afghanistan and Pakistan, and has failed to give due attention to its eastern frontier with Bangladesh. India is witnessing rising turmoil all around its borders, and therefore a stable, moderate Bangladesh as a partner is in its long-term interest. Constructive Indo-Bangladesh ties could be a major stabilizing factor for the South Asian region as a whole. “Today Aung San Suu Kyi has finally been released by the Burmese regime. After the fake elections, this gives at least new hope for a democratic Burma. Suu Kyi has represented in her country the spirit of Gandi of our century, making a nonviolent campaign for democracy and a pacific outspoken opposition to the almost fifty year old ruling military junta.” said Guy Verhofstadt, President of the Liberals and Democrats in the European Parliament, reacting to today’s news that the Nobel Peace Prize winner Aung San Suu Kyi was released, after two decades under house arrest. “Any country oppressing freedoms and human rights will sooner or later face its repercussions. May today’s release also be an example and a sign for China to free 2010 Nobel Peace Prize winner Liu Xiaobo.” Verhofstadt concluded. ALDECALD (Council of Asian Liberal Democrats) currently in Kuala Lumpur (Malasya) will adopt tomorrow a resolution calling on the Burmese junta to open up a dialogue immediately with Aung San Suu Kyi with a view to develop genuine democracy in the country. In 1990 Aung San Suu Kyi was already recognised for the Sakharov Prize by European Parliament that honours individuals or organisations who had dedicated their lives to the defence of human rights and freedom of thought. 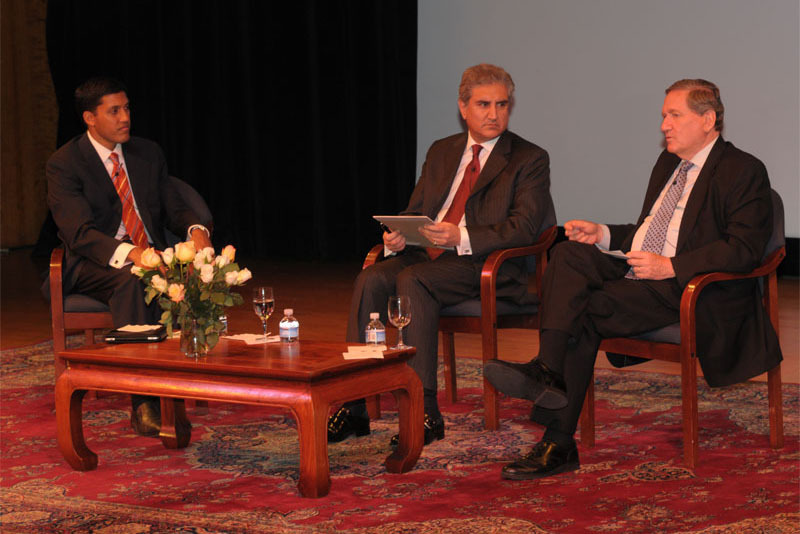 August 19, 2010, before the UN started its meetings, the Asia Society in New York opened the discussion on the Pakistan Flood response by diving right to the bottom truth – the latest mega-disasters have one common cause – human induced climate change. It was Financier George Soros who injected the topic and the media was allowed by Ambassador Holbrooke to follow up. See what you can do when you go outside the UN! Ambassador Dr. Richard C. Holbrooke, former Chairman of the Board of the Asia Society, and now US Special Representative to Afghanistan and Pakistan, chaired the 8:30 am event at his New York home – the Asia Society – on the day when for 3:00 pm the UN General Assembly scheduled a pledging event for funding Pakistan relief. At the UN, for the US, spoke Secretary of State Hilary Rodham Clinton, and I saw on TV the complete Asia Society American team sitting in the hall. The team included also Judith A. McHale, US Department of State Under Secretary for Public Diplomacy and Public Affairs, Dr. George Erik Rupp, a theologian, President of the International Rescue Committee and former President of Rice University and Columbia University, and Raymond Offenheiser, President of Oxfam America. The opening speaker after Ambassador Holbrooke was Pakistani Foreign Minister Shah Mehmood Qureshi, and the panel included also USAID Administrator Dr. Rajiv Shah. Then there was a list of guests that made their comments, followed by questions from the floor and answers from Administrator Dr. Shah and Ambassador Qureshi. “This is a defining moment in Pakistan,” Ahmad said. “This flood has set back Pakistan in a huge way. Out of 175 million people, 100 million are under 25. Those young people are skeptical, and they feel abandoned by the world. The international community has to win hearts and minds of those 100 million youth in Pakistan.” “If there is a sluggish response the terrorists/extremists win.” He also said that last year he had a concert at the UN to show to the young people in Pakistan that there was hope – he said that he is sure the international community will react positively. Ambassador Holbrooke said that in the catastrophe there is also an opportunity, that we should not miss – the people in Pakistan should see that the world is ready to help. He found that these elements of hope in opportunity were missing in the day’s article in The New York Times. For the US the strategic implications are clear. The US pulled out helicopters from the military effort in order to help in the rescue effort. Will the Taliban take advantage of this? A US transport ship with materials arrived to Karachi, and Japan will now also send helicopters to help in the rescue effort. Oxfam America was joined by “Save the Chidren” NGO representative Gorel Bogarde said the obvious – what children most need is food, clean drinking water and shelter. She is most concerned for the moment about the outbreak of water-bourne diseases, such as cholera. We will not repeat here further figures of loss and the size of the calamity. We assume that these are known by our readers by now – we want rather to point out the blunt comments that resulted from the statement by Mr. Soros who linked what happens to our lack of readiness to do something about the human-made climate change. Pakistan is the biggest of the recent disasters he said and we must deal with the root causes he continued. CLIMATE CHANGE IS THE ROOT CAUSE FOR ALL THESE RECENT DISASTERS. Mr. Soros spoke of the coincidence of the Himalaya glaciers melting and the monsoons getting stronger at the same time. At the Q & A part of the program, I asked the last question that was intended to bring the attention back to what Mr. Soros said. My question was something like – I am with Sustainable Development Media and I wonder what Pakistan thinks about Mr. Soros’ statement about climate change – the reason being that the present calamity will repeat itself, so how does one do reconstruction work that makes sense? Ambassador Holbrooke said Thank You and addressed the question first to Mr. Rajiv Shah. We heard from Mr. Christopher MacCormac that after the Earth Quake of 2005 the rebuilding of houses was done according to higher standards – so what we need here in the response to the present calamity is also to build better – but he did not specify, neither did Mr. Holbrooke. This, with the understanding that the increased monsoon floods, joined with the melting of the Himalaya Glaciers, is indeed not a one time shot – but the beginning of a trend – leaves us with very bad premonitions about the future of Pakistan and other low lying lands of the region. This has clearly left me thinking about what means building better? Are we going to take into account these new phenomena resulting from global use of fossil fuels when going from the immediate reaction to the suffering from the floods to the longer range rebuilding stage? This is clearly an area that will be written up much more in the foreseeable future. Ambassador Qurashi was asked by Mr. Holbrooke to react to the climate change implications. Are there additional run-off from the Himalayas? The answer included: The Glaciers melt and what we have in Pakistan are Monsoon water plus glacier melts combined. We have above normal moisture. Collaborate on Water, Himalayan Scientists Urge in “Third Pole” Report. An Initiative Towards Sustainable Development in Himalayan Mountains. Collaborate on Water, Himalayan Scientists Urged-ThirdPole Report. Himalayan countries must set aside their differences and collaborate on science in order to avoid a common water crisis, says a report. Environmental pressures, including those from climate change, could have unprecedented effects on the livelihoods of millions of people in the Hindu-Kush Himalaya region, according to the study, published by the UK-based Humanitarian Futures Programme, the Aon Benfield UCL Hazard Research Centre, and China Dialogue. Yet scientific research is either non-existent or, where it exists, is not shared beyond a country’s borders, said the report, ‘The Waters of the Third Pole: Sources of Threat, Sources of Survival’. And scientists are failing to communicate what they do know to the public and policymakers, it added. The Hindu-Kush Himalaya region provides water for one fifth of the world’s population including countries stretching from Pakistan to Myanmar. “This region is a black hole for data,” said Isabelle Hilton, editor of China Dialogue and a contributor to the report. “Managing this water requires knowledge and cooperation,” she said at the launch of the report last week (19 May) in the United Kingdom. But the region “lacks the institutions and in some cases the political will to address issues cooperatively”. History, diverse languages and cultures, and military conflicts are behind the lack of a concerted effort to study the waters, she said, and now “a multidisciplinary and collaborative approach is needed” to catch up. But this is not high on the public agenda, she said. Stephen Edwards, an earth scientist and research manager at the Aon Benfield UCL Hazard Research Centre, called for more high-quality, peer-reviewed data. “We need to understand problems before we know how to manage them,” he said. But science itself is not enough, he added, “scientists have to interact with economists and policymakers — we need proper dialogue”. Andreas Schild, director general of the Nepal-based International Centre for Integrated Mountain Development, agreed with the report’s conclusions.”Water is one of the most important resources,” he said. “Traditionally there has been no free exchange of information on water discharge and this is practically still the case today. “It is not just a concern between countries, but even within countries, as between the individual states of India. Otherwise, short-term foreign development funds mean there is no consistent long-term data and continuity in research by the institutions based in the region, said Schild. But he added that European organisations, with “Europe-centric” research methods, must share the blame. UPDATED – Author and Journalist Tom Plate adds-on to the Byzantine World of Asian Leaders and is ready to include Ban Ki-moon among them along with Lee Kuan Yew of Singapore, Mahathir Mohamad of Malaysia, and Than Shwe of Myanmar, Kim Jong-Il of North Korea as well. It clearly sells copy for an internationally syndicated good columnist. Is it true that Asians are more concerned about community rights than individual or human rights? Then, what impact does it have on the UN that for information in charge are Japan and China? THE UPDATE IS THAT BAN MAY PULL OUT OF THE DEAL FOR NOW. While Author Says Ban Is 3rd “Giant of Asia,” Ban Denies Making Commitment. UNITED NATIONS, August 12 — Two days after author Tom Plate repeatedly said that UN Secretary General Ban Ki-moon would be the subject of the third book in his “Giants of Asia” series, Ban’s spokesman on Thursday told Inner City Press Ban has not made any commitment to Plate or anyone else. Video here, from Minute 15:33. Also during his opening presentation, Plate said that “Ban Ki-moon confirms that Singapore’s candidate [for UN Secretary General in 2006] withdrew, opening the field even more” for Ban. When is a commitment a commitment? 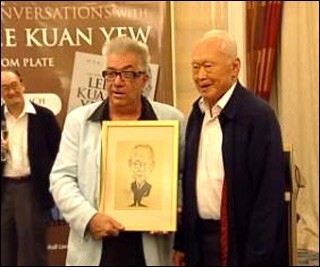 UNITED NATIONS, ICP, August 11, 2010 — Starting with a 200 page book of “Conversations with Lee Kuan Yew,” the get-things-done founder of modern Singapore, American author Tom Plate is engaged in a Giants of Asia trilogy. The next in the series is Mahathir Mohamad of Malaysia. Plate told an audience including the Permanent Representatives to the UN of Vietnam, Costa Rica, The Netherlands and of course Singapore, which hosted the event, that in his experience Asian leaders are more concerned about community rights than individual or human rights. Inner City Press, invited without conditions to the event but then asked to not mention at least one of the attendees, asked Plate if he would consider interviewing some of the some openly authoritarian strong men of Asia, including Than Shwe of Myanmar and Kim Jong-Il of the Democratic People’s Republic of Korea. Without attributing the concerns, there seem to have been a belated request not to publicize the identity of Plate’s third Giant of Asia until after Mr. Ban’s second term is more secure. But, one cynical in the audience asked, is the problem the publicity or the vanity book project itself? 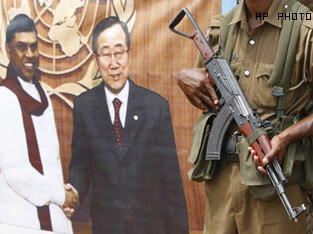 UN’s Ban Depicted in Sri Lanka: Giant of Asia? Plate was asked about this section of the book, and said that it was difficult to keep it in. Afterward, Inner City Press asked Plate to explain: how had wanted the section to come out? Of all that he said Tuesday night, this was the only time that Plate asked to go off the record. We will respect that, just as we’ll respect the request to omit the presence of at least one individual and entourage. Singapore’s Mission to the UN, its Permanent Representative Vanu Gopala Menon, his Deputy, wife and staff are to be commended for hosting such an eclectic crowd, and serving afterward such good food, including the Indian paratha break renamed roti — and tinged with coconut — when it arrived in Lee Kuan Yew’s giant laboratory in one of the smallest nation states. There was Tamil advocates among the attendees, including the son of the plaintiff in a recent free speech case in the U.S. Supreme Court. Some wondered at the irony of Ban Ki-moon, who long delayed naming, and still has not begun, a panel about accountability for civilian deaths in Sri Lanka in 2009, choosing as his conversational biographer the writer who coaxed the above quoted analysis of ethnic cleansing and Sinhalese extremism in Sri Lanka, to the level of the president. We will have more on this and on the rest of Plate’s illuminating talk, including his and Lee Kuan Yew’s views of the UN and the ways in which its Secretary General are elected and, at times, re-elected. The interplay of Ban’s drive for re-election and his participation at Plate’s third “Giant of Asia” will also be explored. 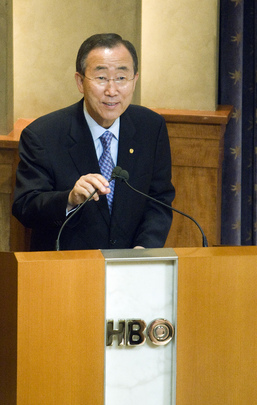 UNITED NATIONS, August 9 — Alternate candidates to Ban Ki-moon are emerging before the next UN Secretary General term begins on January 1, 2012. Tellingly, even people given UN posts by Ban Ki-moon are among reported candidates. Ban named Staffan de Mistura as his representative in Afghanistan, after de Mistura hired Ban’s son in law Siddarth Chatterjee as his chief of staff with the UN in Iraq. (Ban’s son in law has since been hired by Jan Mattsson as a high official of the UN Office of Project Services in Copenhagen). But, people recruited to work for the UN in Afghanistan tell Inner City Press, de Mistura harbors the dream of swooping in as a dark horse candidate to replace Ban in late 2011. There is “blood in the water,” these sources say, particularly following the damning End of Assignment report of Inga Britt Ahlenius. Ban’s “melt down” then retraction on August 9 about job promises made in the course of replacing Ahlenius won’t help either. The problem for de Mistura and other non-Asian contenders is that the S-G position is said to belong to a regional group for at least 10 years. When the U.S. vetoed Egypt’s Boutros Boutros Ghali in 2005, the post next went to another African. So it would be with Ban, the assumption goes, with China demanding equal treatment for Asia. But, as Inner City Press reported some time ago, even Team Ban has a theory that the U.S. might trade its de facto ownership of the top World Bank post to China in exchange for the right to replace Ban with a S-G of its choice. De Mistura, having served as U.S. ground cover and fig leaf in Iraq and then Afghanistan, feels he would have U.S. support. A long shot candidate mentioned is Bill Clinton. Others point to Jose Ramos Horta of Timor Leste, in the Asian group like another candidate, Zeid Bin Ra’ad of Jordan. Lula of Brazil would appear to have lost U.S. support, given his country’s vote against the recent sanctions on Iran. Shashi Tharoor appears to have shot himself in the foot with Cricket-gate. More savvy, some say, is Michelle Bachelet. She is understood to have not leaped at the offer of the top UN Women post. Does this mean that, like with the UNICEF post given to Tony Lake, she is shooting higher? From those heights, at UNDP, Helen Clark is often mentioned. There are other plotters. Some point to the alliance between Ms. Ahlenius and Alicia Barcena, who left the top UN Management post when Ban came in and went to ECLAC in Santiago, Chile. She was in New York and dined with Ahlenius shortly before Ahlenius leaked her memo. Also involved, sources say, was Barcena’s Management predecessor Christopher Burnham. Next in line, they argue, are the Eastern European states. From 2006, there is Vaira Vike-Freiberga. Jan Kubis is mentioned (Ban gave him a temporary post during the violence in Kyrgyzstan), along with former General Assembly president Srgjan Kerim, to whom Ban gave a Special Envoy on Climate Change UN post. Do you see a pattern here? “There are candidates galore, and there is blood in the water,” as one source puts it. Let the games begin. This all comes, as Inner City Press first reported, against the backdrop of ad hoc meetings to “revitalize the General Assembly” which are discussing requiring Ban Ki-moon to come before the GA to seek his second term, and not only the Security Council. In the Security Council, placating or giving patronage to the five Permanent Members would be enough to gain the second term. But if the GA and regional grouping get involved, Ban’s snubs like that of Africa for the deputy post in the UN Development Program, and the devaluation of the Office of the Special Adviser on Africa, could come back to haunt Ban, along with his more recent appointment of Alvaro Uribe to his Gaza flotilla panel, over the objections of Venezuela which wil head the Group of 77 and China. At UN, As Ban Denies Deals with Israel and for OIOS Posts, Doubts Raised About Both, What was US Told? UNITED NATIONS, August 10 — Just as UN Secretary General Ban Ki-moon stated on August 9 that he made no “agreement behind the scenes” that Israeli Defense Forces will not be interviewed by his Panel of Inquiry, he now maintains that no commitment of posts in the Office of Internal Oversight Services was made to gain support for his replacement candidate to head OIOS, Carman Lapoint-Young. Inner City Press on August 10 asked Ban’s spokesman Martin Nesirky had Ban had meant by “we offered a lower rank.” Nesirky resplied that Ban “was confused by what the question was,” and claimed that the comment was a “general statement of principle not related to OIOS.” Video here, from Minute 31:26. It is not a general statement of principle to say ““he was one of the finalists, the South African.. we offered a lower rank.” It is a statement about a particular individual being made an offer. At the end of his August 9 press conference, Ban urged journalists to focus on the “big issues” and not personnel (or “personal”) disputes. But if an answer about offering OIOS post(s) in order to gain support for a candidate for OIOS does not have credibility, how does an answer about a “discrete” agreement about the mandate of the UN Gaza flotilla panel? A Security Council diplomat on August 10 approached Inner City Press with another connection between the August 9 OIOS questions and Ban’s panels on Gaza and Sri Lanka. If Ban was so rattled and pushed by a single journalist — even the “overgrown schoolboy” –imagine, the diplomat mused, what happens between Ban and Israel, or Sri Lanka. Footnote: further to US Ambassador Susan Rice’s statement that the UN’s Gaza flotilla panel is “not a substitute” for national proceedings, Inner City Press is that during the Security Council consultations on the press statement by which Council welcomed Ban’s panel, the U.S. opposed linking the panel to the Council’s own May 31 – April 1 President Statement calling for an investigation. So what did Ban tell Susan Rice and the US about the panel and its scope? Or about post promises made to get Ms. Lapoint confirmed as head of OIOS? UNITED NATIONS, August 9, updated — “I always do the right thing,” UN Secretary General Ban Ki-moon said Monday, faced with long pending questions about mis-management and undermining the independence of the UN Office of Internal Oversight Services. But Ban appeared to admit violating a founding principle of OIOS, that the Secretary General not intrude and give out top OIOS jobs on a political basis. At first Ban suggested these questions be dealt with in a separate session. Then he portrayed them as “small” questions. Many reporters were unclear if they were being directed to not get into “personal” or “personnel” questions. The latter seems difficult, since Ban ultimately said he had personally taken the personnel decision to give the second OIOS post, even before the ostensibly independent new director comes in, to a South African candidate. Many correspondents were frustrated at how the press conference was run, with no questions taken on Sudan — which is threatening to throw the UN out, while starving the residents of the Kalma Camp — or the Rwanda election or the Ban administrations flip-flip on Kashmir. But even those most focused on UN management and Ms. Ahlenius’ damning End of Assignment Report were dissatisfied by Ban’s answer that any questioning of his administration’s ethics is unfair. There are a range of questions, including about Ban’s most senior advisers. These, they say, will be coming out as a second term for Ban is considered. Ban was asked about his Gaza flotilla panel — he said no side agreement was made with Israel not to interview its soldiers — but not about his stalled and even most constrained panel on Sri Lanka war crimes. He was asked about appointing Alvaro Uribe to the Gaza panel, despite Venezuela’s recent complaints. Ban said he has known Uribe as Secretary General for a long time, and that Uribe has his “full confidence.” What will Venezuela, the next head of the Group of 77 and China, say? As one snarky correspondent said after what he called Ban’s “melt down,” this politically is the time when alternate candidates to become Secretary General in 2012 will begin to appear, even before the upcoming General Debate in mid September. Watch this site. Footnote: even on the ostensible topic of Ban’s first press conference since the Ahlenius memo, the High Level Panel on Global Sustainability, lack of candor became apparent. When, after his loss of power in Australia, Kevin Rudd flew to New York and met with Ban, Inner City Press attended the photo op, and noted that Ban’s climate advisor Janos Pasztor was in attendance, and that the meeting lasted a full 50 minutes. Inner City Press asked Ban’s spokesperson if the meeting involved the offering of a UN position of any kind. It was just a courtesy call, Inner City Press was repeatedly told — even after Rudd, back in Australia, bragged through his spokesman about the offer of a post. At the end of Ban’s press conference, Inner City Press asked Pasztor if in the meeting with Rudd, the supposed courtesy call, this post was discussed. Yes, Pasztor said. Some courtesy call. The same snarky reporter laughed at the inclusion of US Ambassador Susan Rice on the panel, calling it a craven attempt to nail down US support for a second term as Secretary General. We’ll see. The Secretary-General wants to make it absolutely clear that the recruitment process for the Director of the Investigations Division will start only after the new Under-Secretary-General of the Office of Internal Oversight Services has taken up her post. This selection will be conducted strictly in accordance with the established rules and procedures. The assertion that a South African was offered the job is completely unfounded. See YouTube – BURMA – NOW IS THE TIME TO MAKE THE STAND. Burma/Myanmar – a State and People that fell through the UN cracks. June 22, 2010 a vigil at the Grand Central Station on 42nd Street. subject REMINDER Tomorrow: June 22, 2010 – Burma Political Prisoner Art & Photo Installation. Reminder: Please join Human Rights Watch and creative agency JWT for our Grand Central Station Burma political prisoners art and advocacy event opening early tomorrow morning at 7:45 a.m. When: Tuesday, June 22, 2010, from 8 a.m. to 7 p.m.
Chanting monks kick off opening ceremonies at 7:45 a.m.; full schedule of speakers and events available. The centerpiece of this event is an interactive installation created by advertising agency JWT which enables visitors to sign a petition to the leader of Burma’s military government, Senior General Than Shwe. Please join us for remarks from members of Burma’s exile community (including monks, dissidents, musicians, and artists), representatives of Human Rights Watch, and members of JWT‘s creative team at 8am, 12:30pm, and 6:15pm. There will also be speakers and performances throughout the day. Burma to become a subsidiary of North Korea? Will the world stand by and just watch the third rogue State implementing open nuclear policy? The following came up also in a journalist’s questions at the UN Briefing on Friday June 4, 2010. The UN Deputy Spokesperson for the Secretary-General had no instructions how to relate to the question. Fresh claims that Burma is trying to acquire the know-how and material to build a nuclear weapon, based on information provided by a former army officer, are published today, renewing concern about the extent of the junta’s military ambitions. Unrealistic experiments and crude engineering suggest that success may be beyond Burma’s reach, say researchers for an opposition Burmese media group. They base their claims on information provided by Sai Thein Win, a former major in the Burmese army, who is said to have been trained in Russia in missile technology. He has since defected from Burma. “The intent is clear and that is a very disturbing matter for international agreements,” said the researchers, Robert Kelley and Ali Fowle, of the Democratic Voice of Burma. “Burma is trying to build pieces of a nuclear programme, specifically a nuclear reactor to make plutonium and a uranium enrichment programme”. A report, Burma’s Nuclear Ambitions, is being broadcast on the Arabic satellite television channel al-Jazeera today. “What we have uncovered is the very beginnings of a nuclear weapons programme,” Evan Williams, the programme’s reporter, said last night. In a related development, Jim Webb, chairman of the US Senate foreign relations subcommittee on east Asia and Pacific affairs, said he had put off a visit to Burma because of new, albeit unsubstantiated, allegations that its military regime was collaborating with North Korea to develop a nuclear programme. “Until there is further clarification on these matters, I believe it would be unwise and potentially counterproductive for me to visit Burma,” Webb said. Kelley and Fowle’s report, Nuclear Related Activities in Burma, contains a copy of what they say is a secret document from the country’s “nuclear battalion”, instructing a factory to build a “bomb reactor”. According to a translation, the letter requests the production of material to make a bomb reactor needed for research “for the use of special substance production”. It is signed by Lieutenant Colonel Win Ko. The request came from the No 1 Science and Technology Regiment, Thabeikkyin, and is dated 4 February 2010. It is colloquially referred to as the nuclear battalion, Kelley and Fowle say in their report. They say that the term “bomb reactor” was “simply a very strong vessel to contain a violent chemical reaction”. Kelley and Fowle compare their source, Sai Thein Win, to Mordechai Vanunu, the technician who blew the whistle on Israel’s nuclear weapons reactor at Dimona. Referring to hundreds of photographs they say he has smuggled out of Burma, they say: “Photographs could be faked but there are so many and they are so consistent with other information and within themselves that they lead to a high degree of confidence that Burma is pursuing nuclear technology”. Despite their view that Burmese scientists are far from acquiring the technology or building anything dangerous, they say their analysis “leads to only one conclusion; this technology is only for nuclear weapons and not civilian use or nuclear power”. They say the country’s nuclear programme is headed by Dr Ko Ko Oo who has openly expressed his interests in “nuclear matters”. They add that Sai Thein Win provided photographs of machinery that could be used for making uranium compounds, including uranium hexafluoride gas used in uranium enrichment. He is also said to have described “nozzles used in advanced lasers that separate uranium isotopes into materials used for bombs”. Sai Thein Win’s whereabouts have not been revealed. Richard Attias was the Producer of the World Economic Forum in Davos, as well as many other major events. Now he creates The New York Forum to try for the real 2010 gold – “REINVENTING THE BUSINESS MODEL.” Action: June 22-23, 2010 at the Grand Hyatt, Manhattan. Richard Attias (born 1959 in Morocc) – he is a global events producer. As chairman of PublicisLive Attias was the producer of the World Economic Forum in Davos for over fifteen years. His personal history and the history of the organizations he was involved with are plainly fascinating and we write this longer posting because we feel that he is embarking now upon even a greater voyage with his new NEW YORK FORUM, then in his previous activities. The World Economic Forum (WEF) is a Geneva-based non-profit foundation best known for its annual meeting in Davos, Switzerland, which brings together top business leaders, international political leaders, selected intellectuals and journalists to discuss the most pressing issues facing the world, including health and the environment. Beside meetings, the WEF produces a series of research reports, and engages its members in sector specific initiatives. WEF also organizes the “Annual Meeting of the New Champions” in China, and a series of regional meetings throughout the year. In 2008 those regional meetings included meetings on Europe and Central Asia, East Asia, the Russia CEO Roundtable, Africa, the Middle East, and the World Economic Forum on Latin America. In 2008 it launched the “Summit on the Global Agenda” in Dubai. The WEF was founded in 1971 by Klaus Martin Schwab, a German-born business professor at the University of Geneva. Originally named the European Management Forum, it changed its name to the World Economic Forum in 1987 and sought to broaden its vision further to include providing a platform for resolving international conflicts. In the summer of 1971 Schwab invited 444 executives from Western European firms to the first European Management Symposium held in the Davos Congress Centre, under the patronage of the European Commission and European industrial associations, where Schwab sought to introduce European firms to US management practices. He then founded the WEF as a non-profit organization based in Cologny, Geneva, and drew European business leaders to Davos for their annual meetings each January. Schwab developed the “stakeholder” management approach which based corporate success on managers taking account of all interests: not merely shareholders, clients and customers, but employees and the communities within which the firm is situated, and governments. Events in 1973 including the collapse of the Bretton Woods fixed exchange rate mechanism, and the Arab-Israeli War, saw the annual meeting expand its focus from management to economic and social issues, and political leaders were invited for the first time to Davos in January 1974. As the years went by, political leaders began to use Davos as a neutral platform to resolve their differences. The Davos Declaration was signed in 1988 by Greece and Turkey, helping them turn back from the brink of war. 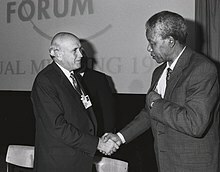 In 1992 South African President F. W. de Klerk met with Nelson Mandela and Chief Mangosuthu Buthelezi at the Annual Meeting, their first joint appearance outside South Africa. At the 1994 Annual Meeting, Israeli Foreign Minister Shimon Peres and PLO Chairman Yasser Arafat reached a draft agreement on Gaza and Jericho. In 2008 Bill Gates gave a keynote speech on Creative Capitalism, a form of capitalism that works both to generate profits and solve the world’s inequities, using market forces to better address the needs of the poor. During the five-day Annual meeting in 2009, over 2,500 participants from 91 countries gathered in Davos. Around 75% (1,170) were business leaders, drawn principally from its members, 1,000 of world’s top companies. Besides these, participants included 219 public figures, including 40 heads of state or government, 64 cabinet ministers, 30 heads or senior officials of international organizations and 10 ambassadors. More than 432 participants were from civil society, including 32 heads or representatives of non-governmental organizations, 225 media leaders, 149 leaders from academic institutions and think tanks, 15 religious leaders of different faiths and 11 union leaders. During the 1990s, Attias founded an Event Management Company and produced various global events including the Zurich Insurances Convention and Boris Yeltsin‘s visit to France. Richard was awarded the contract for the signature of the General Agreement on Tariffs and Trade (GATT) signature agreements in Marrakesh and for the Middle East and North Africa summit meeting in Casablanca. A brief encounter with Klaus Schwab, President of the World Economic Forum, resulted in a long-standing partnership and the eventual creation of the Global Event Management Company. This joint venture agency went on to manage international conferences, including the International Telecoms Union Congress and the Middle East Peace Summit in Jordan and the World Economic Forum in Davos. Richard joined Publicis Groupe in 1998 and established a global enterprise producing events for various clients including IBM, l’Oreal, Uniliver, BT, Avaya, Lenovo, EDF, Sanofi-Aventis, etc. Richard was named Chairman of the Board of Publicis Dialog which combined the operations of Publicis Events and a range of marketing services. In 2004, Richard moved to New York and became chairman of Publicis Events Worldwide, the first world wide events network with over 600 employees. At PublicisLive Richard combined the events company and team to form PublicisLive that specialized in the conception and production of international conferences and very high profile events such as the Clinton Global Initiative Forum, the Islamic Conference, The Petra Conference of Nobel Laureates, the Dalian Economic Summit in China, and the Monaco Media Forum. On March 23, 2008, Richard Attias married in New York’s Rockefeller Centre the ex-wife of French President Nicolas Sarkozy Former French First Lady Mme. Cécilia María Sara Isabel Ciganer-Albéniz (a descendent of the composer). Cécilia Sarkozy visited Libya twice in July 2007 to visit Muammar al-Gaddafi and helped in securing the release of five Bulgarian nurses and one Palestinian doctor who had all spent years on Libya‘s death row after allegedly being tortured into confessing to infecting Libyan babies with the HIV virus. The French left asked for Cécilia Sarkozy to be heard by the Parliamentary Commission expected to be created in October 2007 concerning the terms of the release of the six, as she had played an “important role” in their liberation. A Newspaper interview with Cécilia Sarkozy on October 19, 2007, made it known that she is leaving the President. In 2008 Richard Attias created the Experience Corporation – a U.S. based full service event management and strategic consulting company with offices in New York, Paris, Jeddah and Dubai, that supports government and non-governmental organizations worldwide. As Executive Chairman, Richard oversees the execution and management of global events. Two major recent productions have been the celebration of the 10th anniversary of the accession to the throne of the King of Jordan and the launching of the Bahrain Education Project in Manama on October 10, 2009. The Experience Corporation has also executed more than a dozen corporate and governmental events since its inception in March, 2008. Richard Attias is the Executive Chairman of the Experience Corporation and works there with his wife. 2008, Richard Attias sold the Global Event Management Company and with it the contract with the World Economic Forum. Richard is named special advisor to the Emirate of Dubai to provide a comprehensive strategy to make the city a destination for major conferences, and cultural and sporting events and spends a year and a half in Dubai. Richard Attias is the Chairman the Advisory Board of the Center on Capitalism and Society, directed by Nobel Prize winner Edmund Phelps. Currently, The Experience is making preparations for its New York Forum, the first summit to unite business leaders, sovereign funds and all major players in the global economy for an open, action oriented debate to foster ideas for improvement and reinvent current business models. This brings us to what goes on right now – right here in New York, and we got wind of this from the New York Foreign Press Center where Richard Attias gave a Briefing on-The-Record, June 2, 2010. We learned that this was the launching announcement for the FIRST ANNUAL NEW YORK FORUM, and we bet, in an age of contraction and increased interest in the real world, with demands that go beyond what a resort can provide, the location in New York City might make it possible that the meeting will become even more important then those Davos meetings. The First Meeting will be held June 22-23, 2010, at the Grand Hyatt Hotel on East 42nd Street in Manhattan. If you check the dates – you find that this fits neatly before the G-20 meeting – June 26 – 27, 2010 in Toronto. And as such, we already learned, that a main attraction of this meeting will be Christine Lagarde, Finance Minister of France will be the featured speaker at the closing session June 23, 2010. Lagarde is the first woman ever to become minister of Economic Affairs of a G8 economy. In 2008, Lagarde was ranked the 14th most powerful woman in the world by Forbes Magazine. A noted antitrust and labor lawyer, Lagarde made history as the first female chairman of the international law firm Baker & McKenzie. She has been awarded France’s highest honor, the Légion d’honneur. In 2009, the Financial Times ranked her the best Minister of Finance of the Eurozone. Further we learned that to date, Vikram Pandit, CEO, Citigroup; Edmund Phelps, Nobel Prize in Economics, 2006; Arthur Sulzberger Jr., Chairman and Publisher of The New York Times; Robert Wolf, CEO, UBS Americas; Jonathan Miller, CEO, News Corp Digital; Cathie Black, President, Hearst Magazines; and S.D. Shibulal, Co-Founder of Infosys Technologies, are among the people who have confirmed their attendance. The New York Forum is a call for action by the business community to reinvigorate the global economy and to find new confidence and credibility. Initial support came from the following Forum partners: The Boston Consulting Group, The New York Times, Partnership for New York City, and the Center on Capitalism and Society at Columbia University. The Forum’s distinguished Advisory Board includes Nobel Prize-winning economist and Director of The Center for Capitalism and Society, Edmund Phelps; Partnership for New York City CEO Kathy Wylde; Economist and Planet Finance Founder, Jacques Attali; and Scott-Heekin-Canedy, President and General Manager, The New York Times. From Mr. Attias we learned that his love affair with New York started at 9/11. He saw then how “UNITED WE STAND” was something real in this city. That is how he decided to make it his main home. When the financial crisis struck he was in Dubai – he realized that the economic crisis will follow. He saw there the workers from India losing their jobs without understanding what it is all about. He came back to New York with the intent to create this new platform – the New York Forum with people who really run the show – the business people rather then the politicians. He talks as stakeholders – of NGOs, academics, besides the business people, and he wants them to come up with actual proposals. He will keep them in the discussion groups and wait for solutions. He talks of a call to action and is not shy to say that the problems were started right here in New York, and solutions should come from New York and applied directly in New York. Richard Attias thinks the Financial Crisis is behind us – but we have the Economic Crisis and we must have jobs for people. The 2010 New York Forum will have a total of only 320-360 participants – just 3 plenaries with CEOs and attendees. Also many smaller group meetings, Mr. Attias said that 60 people in a group is the maximum. Further, as he said, at the end there must be a road map on regulations and transparency as needed to create renewed trust in the system. For years we had the feeling of credibility, what happened recently made us lose that feeling and we must restore it. Several days after the meeting there will be a “white book” – 100% transparent, open to the media – at least to the web – and press releases. We got enthused by the fact that Mr. Attias said that while now there are 600,000 cars on the global roads every day, when China matches us in the ratio of cars per people, there might be 2 billion cars on the roads of the planet – and this is not negotiable. Different transportation systems must be established. indeed, in his briefing Mr. Attias did not go into details of a green economy, or of the actual alternatives that must evolve. We realized that in ways he wants to keep his neutrality before the dialogue, but it is clear that no results are possible if all our favorite arguments will not be part of this dialogue. Therefore we are confident that the Forum can be the answer to just what the doctor found in his diagnosis: The crisis started in New York and the road map will be drawn in New York in order to effect the financial institutions, that will from now on, have to handle with complete transparency the requirements of sustainability. He picked New York also because its rich cultural life, in this respect it might be more to the point then going away to a retreat. With a composition as diverse as including people from South Africa, India, Dubai, Korea, etc. a process of innovation may be started at this forum. He has extended invitations to Sovereign Funds- so governments like Saudi Arabia will be present. UN WIRE presents FOREIGN POLICY MAGAZINE showing that Ban Ki-moon is frantically looking for a peace breakthrough in his fourth year at the helm of the UN. Why does he not just laser-focus on the Korean Peninsula – an area we thought he was destined to solve? He needs just one success to save the job. 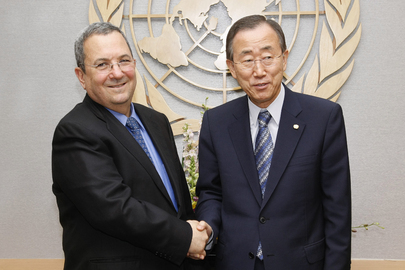 U.N. Looks for Diplomatic Breakthroughs: U.N. looks for diplomatic breakthroughs in 2010. Ban Ki-moon and his diplomatic envoys have been scouring the globe this week in search of a promising peace settlement for 2010, pursuing talks with Kim Jong Il’s government in North Korea, Afghanistan’s Taliban, and Turkish and Greek Cypriot leaders. These latest diplomatic initiatives follow a year that brought few breakthroughs on the mediation front as the U.N. strained to advance democracy in Burma, head off mass rights abuses in Sri Lanka, and manage a crisis that threatens to trigger a resumption of civil war in Sudan. 1. Cyprus. Ban traveled to Cyprus this weekend to nudge Demetris Christofias and Mehmet Ali Talat, the parties representing the ethnic Greek and Turkish sides of the island, into a breakthrough in a conflict that has lasted more than 35 years despite repeated efforts at mediation. Ban said that he is confident that a political settlement “is within reach.” But the two Cypriot leaders appeared more downbeat about the prospects for a deal. Cyprus has been split since 1974. Talks between the two sides during the past 17 months have produced some results, including an agreement to open a pedestrian crossing in Nicosia, the divided capital. But there is concern that April elections in the Turkish section may bring a hard-liner to power. “Time is not on the side of settlement,” the two leaders acknowledged in a joint statement Monday. 2. North Korea. Ban, a former South Korean diplomat, has been seeking a role in the North Korea crisis since he first took office in January 2007. A confidential U.N. policy paper, produced on April 25, 2007, called for “intensifying and expanding engagement” with Pyongyang, and possibly for the appointment a special North Korea coordinator. But initial attempts to start talks faltered after North Korea launched its missile test and detonated its second nuclear explosive last April and May. On Sunday, Ban announced that he would send his top political advisor, B. Lynn Pascoe, a former U.S. diplomat, to Pyongyang to restart high level U.N. talks later this month. He will be joined by Ban’s top Korean aide, Kim Won-soo. Can Ban be far behind? 3. Afghanistan. The U.N.’s outgoing special representative, Kai Eide, held secret talks with members of the Taliban sometime last year. Eide has been pursuing such contacts with the Taliban since he first started his job. U.N. sources described those talks as highly preliminary, and said that they do not have the approval of the Taliban leadership, which claims that its movement is not negotiating with the U.N. But an official close to the talks confirmed that they had in fact taken place and that Eide’s successor, Staffan di Mistura, would likely continue pursuing those contacts. While these discussions offer little hope of providing a breakthrough, they could provide a useful back channel over the long haul. 5. Burma. U.N. diplomatic efforts in Burma have pretty much run aground. Ban has reassigned his top Burma envoy, Gambari, to Sudan, and made his chief of staff, Vijay Nambiar of India, his temporary point man on Burma. The Burmese military junta recently rebuffed a U.N. request to invite Gambari back to the country for a final visit. U.N. diplomats say that Burma has little interest in meeting with the U.N.’s diplomatic placeholders, particularly now that the Americans are looking to engage the regime directly. The Tripsing Ban Ki-moon in the helicopter to Yangon to meet what? A Joke on the East River taken to account by the critical press. UN Secretary-General Ban Ki-moon has just spent a weekend in Myanmar/Burma with zero achievement to show followed by some hard to understand statements that read as if the ruling general told him that after he makes sure that the generals continue to rule the country, he is ready to take of his military clothes and rule as a civilian. This is about what Ban Ki-moon wants the UN to accept as a result of his trip. Now, it is clear that the junta has opened the country to international search for oil and that multi-billion dollar reserves of oil were found, and Russia and China ready to make sure that he stays in power as he will be good to their interests – others would like also a piece of the pie – so go and understand what actually goes on in the country. The one thing clear to the world is that Ban Ki-moon did not get a glimpse of the junta’s prize prisoner – Nobel Peace laureate – San Suu Kyi. On the other hand, knowing that he travels into unchartered waters, the UN high flying staff made sure that the journalists that will accompany him on this trip will not be of the investigative kind – say mildly rather of the chewing gum kind – so they made sure to clean the list of anyone who might have been of the independently thinking kind, of whose numbers were left preciously few – in effect we could count them on the fingers of one hand. This last small bunch, is starting to look at the UN and its present chief as the the joke on the East River. Why are we so much interested in this? simply as we said in the past, when only just into his new position at the UN, UNSG Mr. Ban went to Addis Abeba beginning of 2007 to what the African Union had planned as a high level meeting on climate change in Africa, but Mr. Ban Ki-moon was set up by his staff to talk there on Darfur and nobody of his spokespeople or information people wanted to hear of anything else. I wanted to go on that trip – but was flatly told yes but not you. When Mr. Ban came back nobody spoke of climate change. I got eventually my information by going on an independent trip to Ethiopia much later – but learned what the UN staff of this UNSG will allow and how they pick their choices for whom they allow to cover a trip. That is how now M. Matthew R. Lee could not go to Myanmar/Burmah – this because he is one of the few independently thinking journalists left at the UN – the house of the joke on the East River. Being UNSG is a tough job and real help is hard to find if you do not seek it. UN’s Secretary-General, the Diplomat he is, Avoids All Hot Spots – So What Is The UN for – If Not In Order To Avoid A New Col War Which Might Be Part Of A Hot War? The Avaaz.com August 23, 2008 – PRESS RELEASE – Will Appear In The International Herald Tribune and Chinaâ€™s Ming Pao, on the Day of The Beijing Olympics’ Closing. It Will be a Virtual Handshake that Will Say – Love China / Love Tibet / Love Burma / Love Darfur – and Will Promote Human Rights For China – a Handshake to the World with 175,000 Signatures. The August 23, 2008 – PRESS RELEASE – Will Appear In the International Herald Tribune and China’s Ming Pao, on the Day of The Beijing Olympics’ Closing. It Willl Say – Love China / Love Tibet / Love Burma / Love Darfur – and Will Promote Human Rights For China – a Hanshake to the World. A virtual global handshake will land in Beijing tomorrow ahead of the Olympic Closing Ceremony. To culminate the campaign, this weekend, Avaaz.org has taken out an advertisement in Saturday’s International Herald Tribune and China’s Ming Pao to deliver the handshake to the world. “Some in China have slandered human rights activism as violent and anti-Chinese. Our handshake campaign is an attempt to reach out to Chinese people and show that our call is for peaceful and respectful dialogue”, said Avaaz Executive Director Ricken Patel. However, Avaaz is concerned that the end of the Olympics may herald an era of further oppression. “People around the world are concerned that the Olympics are coming to a close without any changes in Chinese policy on Tibet, Burma or Darfur — will things get better or worse?” said Patel. Avaaz is a global web movement with over 3.3 million members worldwide, working to ensure that the views and values of people everywhere inform global decision-making. Avaaz means “voice” in many languages. Sinkhole Burma/Myanmar and How The UN Wastes Money Intended For Humanitarian Purpose. What Do The Governments of the UK, the US, and Switzerland Say to the UN Secretary-General, to Sir John Holmes, and to Administrator Kemal Dervis? Subject: International Organization for Migration: Press Briefing Notes 29 July 2008. MYANMAR – UK Backs IOM Medical Teams in Cyclone-Affected Irrawaddy Delta – The UK’s Department for International Development (DFID) has pledged £428,000 (US$ 850,000) to support IOM medical teams providing primary health care to Cyclone Nargis survivors in the Irrawaddy Delta. The project, which was included in the UN Flash Appeal for Myanmar issued earlier this month, targets primary health care needs in South West Bogale (Tabin Seik), Eastern Bogale (Amar) and Mawlamyinegyun. IOM mobile medical teams, using Zodiac inflatables and other boats to access remote locations hit by the cyclone, have treated over 24,600 patients in 327 villages in the Delta townships of Bogale, Pyapon and Mawlamyinegyun since the cyclone struck Myanmar on 2nd May. IOM has also set up 15 temporary tent clinics in areas where medical infrastructure was completely or partially destroyed by the cyclone. “People are mainly suffering from the effects of unclean water and food, lack of proper shelter and clothing, and a lack of proper sanitation,” says IOM Myanmar National Health Coordinator Dr Aye Aye Than, who heads up the Bogale health team. The DFID funding will support both the mobile teams and the clinics for up to six months, employing some 44 medical staff, together with ancillary logistics and coordination personnel, as well as paying for essential medicines and medical supplies. “This funding will allow us to meet one of our top priorities – continuing to deliver primary health care to cyclone survivors – while communities start to recover and rebuild pre-cyclone health infrastructure,” says IOM Health Programme Manager Dr Nenette Motus. “We are also appealing for additional funding to rebuild primary health care facilities and birth centres, strengthen the delivery of mental health services and raise HIV and AIDS awareness in communities displaced by the cyclone,” she adds. IOM’s Cyclone Nargis relief operations in the Delta are now coordinated from offices in Bogale, Pyapon and Mawlamyinegyun townships. In addition to providing direct medical aid, they have included the ongoing distribution of relief items including tarpaulins, jerry cans, chlorine for water purification, hygiene/family kits, rain ponchos and insecticide-treated mosquito nets. Other donors contributing to IOM’s response to the disaster include the UN Central Emergency Response Fund (CERF), USAID/OFDA, the Swiss Agency for Development and Cooperation (SDC), AmeriCares Foundation, International Medical Corps, and Chevron. For more information, please contact Chris Lom at IOM’s Regional Office in Bangkok. Email: clom at iom.int. Tel. +66.819275215. In the light of the continuing releases by Inner City Press – from the UN building in New York – the UN has lost at least US$10 million in fraudulent exchange rates with the Myanmar government – so how does the UK handle these disbursements for the humanitarian activities in Myanmar/Burma? Sir John Holmes, the UN Under-Secretary-General for Humanitarian Affairs and Emergency Relief Coordinator, is from the UK and it seems that he is continuously fooled by the Burmese Officers’ junta. By LALIT K JHA, Tuesday, July 29, 2008. The Irrawaddy, Covering Burma and South East Asia out of Thailand. NEW YORK — The chief UN humanitarian official said on Monday that the loss of crucial foreign aid due to distorted currency exchange rates, while “unacceptable,” should not be the basis for stopping or restricting UN-led international relief operations in cyclone-devastated parts of Burma. “The losses are significant, but not absolutely gigantic,” John Holmes, the UN’s under-secretary-general for humanitarian affairs, told reporters at the UN headquarters in New York on his return from a three-day trip to Burma. Holmes was in Burma last week visiting parts of the Irrawaddy delta, which was devastated by Cyclone Nargis in the first week of May, to review the progress of humanitarian relief work in the region, and then traveled to the new capital, Naypyidaw, to meet the prime minister and other senior junta officials. This was the first visit to Burma by a top-level UN official since Secretary General Ban Ki-moon’s trip to the country in May. Holmes estimated that the UN, which was initially reluctant to acknowledge the substantial loss of foreign aid money due to a currency exchange mechanism dictated by the junta, has lost some US $10 million of the $200 million in aid money it has so far dedicated to the relief effort. “Clearly this is a significant problem in terms of the loss generated,” Holmes said. “That’s why we’ve raised it with the government now.” He added that the UN was pressing the Burmese regime to help minimize the currency loss. Responding to a volley of questions from the media on this issue, Holmes said the impact of the currency exchange rate was being felt in areas where money is being spent locally, and not on imported goods or international staff salaries. The UN’s Office for the Coordination of Humanitarian Affairs (OCHA) has calculated that the exchange rate affected about one third of total aid expenditure, he said. Holmes said, clearly the current situation “is not acceptable when we’re losing 20 percent, even if it’s only on some of our expenditures.” He acknowledged that donors have expressed concern about the matter, but this is unlikely to have any adverse impact on these countries’ contributions towards the UN flash appeal, which now totals $482 million. “This is a complicated issue, which we’ve had some time getting our heads around,” he said, adding that OCHA, which he heads, was not aware of the extent of the loss when he presented the revised appeal. “If we had known it at that time, maybe it would have been better to include it in the appeal,” he said in response to a question. “Obviously we would like to have a situation where there was no exchange loss. The ideal situation would be if we could pay with our dollars and get the market rate back in kyat—and that is what we’re asking for,” he said. “Whether that can be achieved is another question, especially since any organization working in a country has to operate according to the rules of the host government. Those rules have been in place for a long time, but the problem is growing because the spread has widened so much,” he observed. “Perhaps we were a bit slow to recognize—because the spread suddenly widened in June—how big a problem this was going to become for us. We have recognized it and are taking it up with the Government,” Holmes said. Giving his impression of the progress of the humanitarian relief operations in the Irrawaddy delta, Holmes expressed a sense of satisfaction and said he appreciated the steps taken by the Burmese military junta in this regard. “We’re in a much better position than we were just a couple of months ago,” Holmes said. Citing major efforts to rebuild homes, repair schools and get health clinics up and running, Holmes said there has been a lot of progress in the last two months. Farming and other agricultural activities were also picking up, he said. “A degree of normality” is beginning to return in some areas around the delta region, with many schools functioning and increased traffic on major waterways, he observed. At the same time, Holmes asserted that challenges remain with regard to the humanitarian relief work in the Irrawaddy delta. “There is no room for any kind of complacency. There is still a lot to do to make this operation a lasting success and to reach all people with what they need for a sustained period,” he said. The main challenge for the next few months, Holmes said, is to ensure a more systematic pipeline of aid, both food and non-food items. It is important to reach out to those in the most remote areas who were difficult to reach because of poor infrastructure. “Systematic aid delivery is needed for at least six to nine months,” he said. Among other challenges for the relief operation is the drop in the number of World Food Programme helicopters from ten to five. Holmes hoped that some of these five could be kept flying for at least three or four months. This is to ensure that the most remote areas could be reached by aid workers delivering goods and supplies, he said. UN loses $10m aid in Burma exchange rate scam. The UN has admitted losing about $10m ( £5m) to the Burmese regime while delivering emergency aid to the country in the aftermath of Cyclone Nargis because of a distorted official exchange rate. The UN’s senior humanitarian aid official said it had suffered the “significant” loss because the junta enforced an artificial exchange rate that was at least 15 per cent lower than the genuine rate. It has been alleged that the UN had been aware of the loss for weeks and had accepted it as the price of “doing business” with the regime. The losses came about because of the system whereby, when providing aid, the UN uses foreign exchange certificates with a nominal value of $1 each that are then exchanged for the local currency, the kyat, at a rate set by Burma’s military government. The market rate for kyats is close to 1,100 per dollar, but the UN exchange rate is now about 880. As a result, the Burmese regime has been making a healthy profit even as the UN provides emergency support. Mr Holmes said he did not know where the money was going or who was directly benefiting. The Inner City Press blog that first posted the allegations of the losses said some humanitarians believed that allowing the government of General Than Shwe to make a profit was a price worth paying. It also said officials have been aware of the losses since early June. This month, the UN issued an appeal for more than $300m in extra aid for the country. As we realize that it will be hard to come by accountability at the UN, the purpose of our posting this is to ask if the UK government is ready to assume oversight for the funds for which it caries responsibility to UK taxpayers? Further, we see that also USAID/OFDA, the Swiss Agency for Development and Cooperation (SDC), or the US and Swiss taxpayers, are funding these operations also. So what do the US and Swiss Administrations say of the transfer of funds to the Burmese junta rather then the full use of those funds for the humanitarian work? Also, even when NGOs or an oil company like Chevron, spend money on a humanitarian operation, these funds are mostly tax-deductible, so again the regular Joe who pays the taxes, it is his money, that was mismanaged under UN auspices. The Honest Question is – Can This UN Management Be Trusted To Handle Money or Anything Else? Now it is Accepted Officially At the UN, Something www. SustainabiliTank.info Argued Three Years Ago – The UN Funds The World’s Worst in a Neat Way – Call It Exchange Rates. We Had Brought This Up As A Way UNDP Did Fund The North Korean Atom Bomb, Now UNSG Holmes Recognized As Correct The ICP Statement That The UN Funds The Myanmar Government. U.N. admits “significant” Myanmar exchange rate loss. By Louis Charbonneau and Megan Davies, Reuters, Tuesday, July 29, 2008, based on reporting by Matthew Russell Lee on Inner City Press (ICP), and reposted by the UN WIRE of the UN Foundation. UNITED NATIONS (Reuters) – The top U.N. humanitarian affairs official said on Monday the world body had suffered “significant” losses while delivering cyclone aid to Myanmar due to a distorted official exchange rate. Earlier this month, the United Nations issued an appeal for more than $300 million (150.5 million pounds) in extra aid to cope with the effects of Cyclone Nargis that struck the Irrawaddy Delta region in early May, leaving around 140,000 people dead or missing. Under-Secretary-General for Humanitarian Affairs John Holmes told reporters the United Nations has lost about $10 million in currency exchanges so far as it pays for a variety of goods and services in Myanmar. “We were arguably a bit slow to recognize … how serious a problem this has become for us,” Holmes said, adding the loss was “significant” and that the spread between the market and official rates widened suddenly in June. The loss comes from a complicated system whereby the United Nations uses foreign exchange certificates with a nominal value of $1 each that are then exchanged for the local currency, the kyat, at a rate set by Myanmar’s military government. The market rate for kyats is around 1,100 per dollar but the U.N. rate is now around 880, according to the Inner City Press www.innercitypress.com), a blog that covers the United Nations and first raised the currency exchange issue. Holmes, who spoke at the United Nations after returning from a trip to the Irrawaddy Delta, said relief efforts were improving, with almost everyone affected by the cyclone now having been reached with items like food or shelter. He later said he was not aware of any countries refusing to contribute because of the currency loss but that donors were only just realizing themselves the extent of the problems. Withdrawing aid would only hurt the people of the Delta who needed help, he said. U.S. Ambassador Zalmay Khalilzad said he was looking into the issue. “Of course we are against any waste of resources that taxpayers around the world and member states provide to meet the needs of people around the world,” he said on the sidelines of a Security Council meeting on unrelated issues. Inner City Press reported last week the junta changed the official exchange rate since the cyclone so that the estimated loss of the United Nations had risen to 25 percent from 15 percent on the spread between the official and market rates. It reported on Monday that an internal memorandum showed the United Nations was aware of the problem in June. The International Monetary Fund raised the issue of what it described as Myanmar’s distorted official exchange rate in a report in November 2007. “The use of the highly overvalued official exchange rate for conversion purposes results in understatement of external trade and the foreign component of consumption, government expenditures, and investment,” the IMF said in the report said then the IMF. Holmes said it was unclear where the exchange rate losses were going and who specifically was benefiting. “I’m not saying that there isn’t some benefit to the government in the spread somewhere — the likelihood is that there is,” Holmes said.